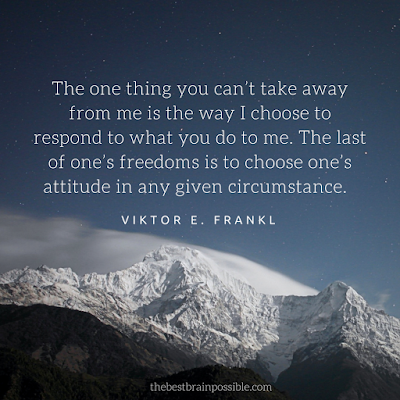 I need to reread Viktor Frankl's Man's Search For Meaning as I've been reflecting on some of his quotes around choice and attitude lately. If you aren't familiar with Viktor Frankl he survived years in a Nazi labor camps, including Auschwitz, where his parents, brother and pregnant wife died. Out of a situation that most of us can't even truly grasp, he came out of it to give us words like this. You think about the things we complain about in our lives, and the things we feel have no control over, they are most often inconsequential. Yet we let these things control our thoughts and feelings. I realize that some of my core values in my life are based around lessons Viktor Frankl has given. I can't control what life throws at me, but I can control my attitude and how I react to the situations I'm in. It does no good to worry about things that I can't control. Most things we worry about in life aren't really that big of a deal. I get that things in your life aren't always what you want, now what? You have a choice before you. You have control over what comes next. I am watching as my children grow up and finding that one of the hardest things I've had to teach them is how to worry about the things that you can control. They are like most of us in that things others do or say can drive them nuts, including their parents and their sisters. It is a good opportunity to teach them about grace, forgiving someone even though it feels like they don't deserve it, but also to remind them of what they can and can't control. The things that we can control are the things we should be focusing on because the rest will just waste our time and energy, ultimately leaving us feeling more frustrated and angry. It is a good reminder for myself, because if I'm being honest, there are times that I do the same thing. We probably all do because we are only human. This graphic from Jon Gordon is a good reminder of where our focus should be. A new dance season is fast approaching for my girls, they had auditions last week and they are anxiously awaiting the announcement of the new teams. It is always a nervous time as they wonder if they are good enough to make the team they want or if they will be on the same team as their friends. A while back I posted about what I hope my girls are learning from dance, but now I'm thinking about what I hope they remember as they learn about their teams and that they keep with them through the ups and downs in the upcoming season. Beyond dance, I believe that all great teams have these same qualities. What Does It Mean To Be A Family?